Chicago Mayor Rahm Emanuel speaks during an interview with the Associated Press in Beijing, Thursday, July 12, 2018. 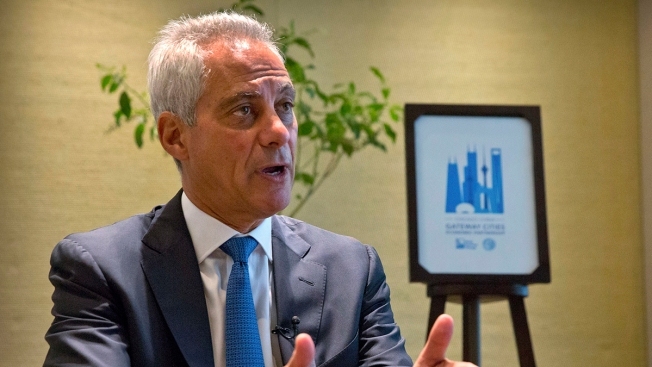 Chicago Mayor Rahm Emanuel, on a mission to salvage business deals threatened by a tariff war, said Thursday that Chinese officials expressed confidence they can survive the spiraling dispute with Washington. The mayor met with Vice President Wang Qishan and China's commerce minister this week in an effort to lock in a $1.3 billion deal for a Chinese company to assemble rail cars in Chicago. The foreign ministry said Wednesday that China will take "firm and forceful measures" if President Donald Trump goes ahead with a second round of tariff hikes on Chinese goods in a dispute over Beijing's technology policy. "They wanted to communicate, obviously, that this is not their preference," Emanuel told The Associated Press. "They would rather work something out, but they're not scared if this is where it goes." After meeting with executives from the Chinese railway car manufacturer, Emanuel said he is committed to completing the project. The factory construction will soon be finished and employees from Chicago are due to arrive in China for training, he said. The U.S.-Chinese conflict has rattled businesses that worry trade and investment might be disrupted. The Democratic mayor said he hopes to "hermetically seal" off Chicago, a city of 3 million people, from the impact of the dispute, in which the two nations' governments have raised tariffs on billions of dollars of each other's goods. The railway venture is expected to create more than 200 jobs, and cargo from China also contributes to Chicago airport revenues. "We don't want our relationships to be influenced by the winds of where the trade and tariff battles are," Emanuel said. Emanuel said he had not initially expected to meet with Wang, an adviser of Chinese President Xi Jinping who is believed to have an outsize influence on foreign policy. On Friday, Washington imposed 25 percent tariffs on $34 billion in Chinese products. Beijing responded by imposing similar duties on the same amount of U.S. imports.